One of the attractions of the Uists is its bird life. It is the birds that settle in these islands for the winter, those that breed here in the summer and the magnificent raptors that remain all year round that make the Uists a destination for most birders at least once in their lifetime. Then there are those birds that can be seen during migration, making a brief stop over to refuel before moving on to a more favoured location and, especially in the autumn, the possibility of a rare vagrant arriving on strong westerly’s or over shooting from the east. Because of this, it is quite often the case that the more common species are overlooked and not worthy of much note except for a “tick” in the box on a day or trip list, and yet they lead equally intricate and complex lives. One such bird is the humble House Sparrow. When arriving in Askernish, we were struck by the number of House Sparrows to be found in and around the township. These rather drab birds are all too often overlooked and still considered to be a common species by many, whereas in fact they are declining so rapidly in the UK that they are a “Red List” bird. This means that they are a bird of national concern, having declined by more than 50% in the last 25 years, yet here in Askernish and throughout the Uists, they are still able to flourish. In consultation with the British Trust for Ornithology (BTO) who actively encourage the monitoring of Red List birds such as House Sparrows, we joined the Retrapping of Adults for Survival (RAS) scheme. This involves individual ringers throughout the UK trapping and then recapturing as many adult birds from previous years as possible during the breeding season in order to monitor their survival. As House Sparrows are one of the most sedentary of all species, we decided to colour ring the birds as we could then identify individuals visually rather than having to recapture them. It also eliminated the need to trap birds at the nest when they would be more likely to desert eggs or young. 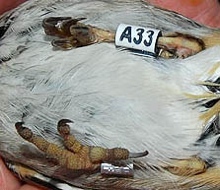 When the birds are first captured, they are fitted with a standard BTO aluminum ring on the right leg and a colour ring on the left. The colour rings are white with black lettering consisting of a unique combination of one letter and two numbers starting at A00 and currently running to B99. The rings and colour rings are very light and designed to not affect the bird in any way, to do so would negate the purpose of any study. To date we have colour ringed 200 individuals, many more than we originally thought. The data that we are now collecting will be correlated by the BTO and so further our understanding of this species’ behavior, survival rate and hopefully the reasons behind their decline in other parts of the country. 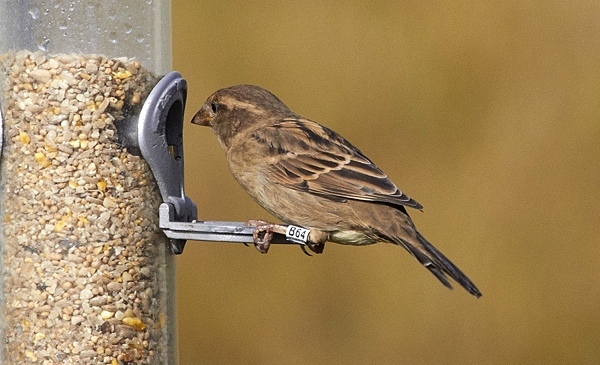 Data for the BTO RAS is only collected during the breeding season, April to August, but because we colour-ring the birds, it means that we are able to monitor these birds all year round. Having collected data since November 2010, we can now start to draw some conclusions of our own. The population here in Askernish currently consists of some 70 individuals and has remained remarkably constant. This in itself is surprising as one rarely sees more than 30 sparrows at any one time. There is a nucleus of 45 birds, all of whom were ringed at the start of the project as adults and have remained in our study area. Another 15 birds were ringed prior to the breeding season and have also remained in Askernish. A further 30 birds were colour ringed outside of the breeding season and subsequently moved on after only a few days. During this, the first breeding season of our study, we caught and colour-ringed 95 juveniles which is an indication of a higher productivity rate than experienced in other parts of the UK. Of these 95 individuals, only 10 have remained here in Askernish, the others either dispersing or not surviving the rigours of life. A further 10 birds arrived soon after the breeding season and have remained in Askernish ever since. These birds are presumed to be juveniles from other parts of the Uists as current thinking is that it is only first year birds that disperse, the adults being sedentary after breeding in their second calendar year. It is unfortunate in this respect that juvenile House Sparrows undergo a complete post juvenile moult thus making them impossible to distinguish from adults. We have also been able to monitor dispersal through other people reporting sightings of colour-ringed birds. As mentioned before, House Sparrows are a sedentary species, not renowned for long distance movements, but already 7 individuals have been reported to us from other parts of the islands. There has been 1 seen in Grimsay (22.5) miles, 1 found dead in Smerclete (6.5 miles) and 4 individuals have been reported in South Glendale, a distance of 6.8 miles. Remarkably 1 of the South Glendale birds is commuting on a regular basis between two sites, returning to Askernish for a few days each month. Even more astonishing was a sighting in Bayhead, North Uist, this individual travelling a total of 27 miles as the crow flies. There have been very few records of a House Sparrow moving such a distance. This study, although still in its early days, has given us sufficient information to draw these preliminary conclusions. As the study continues, it will be very interesting to follow the fortunes of these birds and to see how the dynamics of the population here in Askernish changes over the years.